It is important to balance your fluid intake while you are active, as dehydration can have a negative effect on your performance. During sports you lose both, water and electrolytes through sweat. Therefore you should make sure to drink enough before, during and after your sports activities. 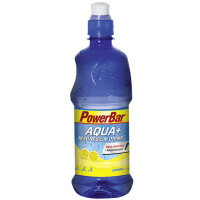 AQUA + MAGNESIUM DRINK is designed to refresh and provide you with the electrolyte magnesium, without any extra calories. 112.5 mg magnesium per bottle. Magnesium supports normal energy metabolism and muscle function. Natural mineral water, acid (citric acid, malic acid), magnesium carbonate, natural flavouring, preservative (potassium sorbate, sodium benzoate), sweeteners (cyclamate, acesulfame-K, aspartame). Contains a source of phenylalanine.